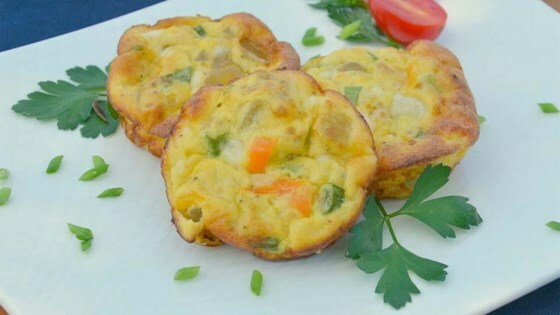 "Lactaid® cottage cheese, eggs, diced green chilies and sweet peppers combine for protein-packed breakfast muffins." Preheat oven to 400 degrees F (200 degrees C). Spray 12-cup muffin tin with cooking spray. Beat eggs until thoroughly combined. Stir in cottage cheese, diced green chilies, green onions, sweet bell peppers, salt and pepper. Stir to combine. Pour mixture into prepared muffin tin. Bake in preheated oven until set, 15 to 20 minutes. Loosen muffins from the muffin tin while still hot. Good,,, Can use a little more flavor. Quick nutritional breakfast when the mornings are crazy! I didn't have bell peppers so I used Rotel diced tomatoes and green chilies. I drained it will. I have made these 5 times and boy are they great! I make them in larger muffin pan. Great make-ahead food!